In the past few years, the Louisville Slugger Prime has risen to become one of the most popular bat choices for players across the country. The 2018 Prime 918 looks to continue that trend with a brand new look and some minor upgrades. At $449.95, it competes at the highest price point with other bats like the Rawlings Quatro, Demarini CF Zen / Insane, Easton Mako Beast and Axe Avenge which are all multi-piece composite bats. If you’re in the market for one of these, the competition is stiff, so read on to see where the Prime 918 falls. The whole Louisville Slugger line received a complete makeover for 2018. Starting with the Grip, the Prime once again includes a custom Lizard Skins. A glossy handle transitions into a full matte black barrel with a gray Tru3 piece that uses a red band and blue lettering. The barrel design prominently features the “918” in a large bold font on each side. Towards the end cap, Slugger has kept their “torch” area that includes the LS logo and made it glossy in light blue. The small blue shape under the word Prime is glossy as well and shows a little sheen under the light. The Prime received a new end cap, the RTX, which is more design focused and turned out pretty nice. Overall I think the bat looks great. It’s sleek, smooth and definitely looks high end. The new blue color is a welcomed addition versus the neon yellow they have used on the past couple of models. The Prime 918 looks to be using the same one as it has in previous generations. It is actually among one of the bigger knobs in the class and doesn’t have any special contour to it as some competitors use. The knob does transition into a handle taper that feels pretty cushioned. It is most likely made out of some type of stiff foam versus rubber. If this bat has a downfall, in my opinion it’s the sound. The Prime sounds like an old composite bat that creates a loud “thud” on impact. While sound obviously isn’t the end all be all, having a little more crack or ping in there would help the cause. Then again, if it performs, who cares? This year Louisville has added their own version of a swing weight scale to help players learn about MOI (moment of inertia) and how the different models will swing. The LS BBCOR Swing Weight scale scores from 1-5… 1 showing balanced and 5 end loaded. This is a bit different than the route Easton has taken who lists the abbreviated number for the actual bat MOI. For example, a 9.2 on the Easton Swing Weight Index actually represents 9200 MOI points. While the Louisville 1-5 scale only tells us where each bat falls within their line, I still applaud them for taking steps to identify each swing weight / MOI. The Prime 918 has the second lowest swing weight in the 2018 Slugger line with a 1.7, only behind the Solo 618 at 1.1. With the low swing weight and large barrel, it will once again be a very popular choice for a variety of high school hitters. It’s easy to get through the zone so you won’t have to worry about the barrel lagging in your swing at all. One concern many players have had with the Prime has been movement in the Tru3 connection. It has been known to twist and even “click” on impact providing an unsure feeling. Last year Slugger said that they firmed up the connection to give it a little bit stiffer feel. From what we have heard as a whole, it has helped curb some of the issues. While hitting, I never felt any unnecessary movement in the transition. Since it is a multi-piece bat, you will always feel slight movement depending on where you make contact. In my testing, the Prime performed extremely well. Last year Slugger introduced their Microform Composite Technology, which consists of much smaller pieces of material that create the composite layup versus longer sheets. Composite bats are built by using multiple pieces of composite material stacked on top of each other. The angle in which they are stacked has an effect on how a specific barrel location performs. The Microform gives the bat’s engineers more control in tuning the barrel, which enhances performance along a longer surface. One new feature mentioned earlier that Slugger added this year is the new RTX end cap. While the design is a nice bonus, they say that it also allows the barrel to be longer. I’m still in the process of confirming the tech story behind it, but my best guess is that they were able to use less end cap material and used the saved weight to add onto the barrel length. One thing that did stand out during the testing was how soft the barrel felt on impact. 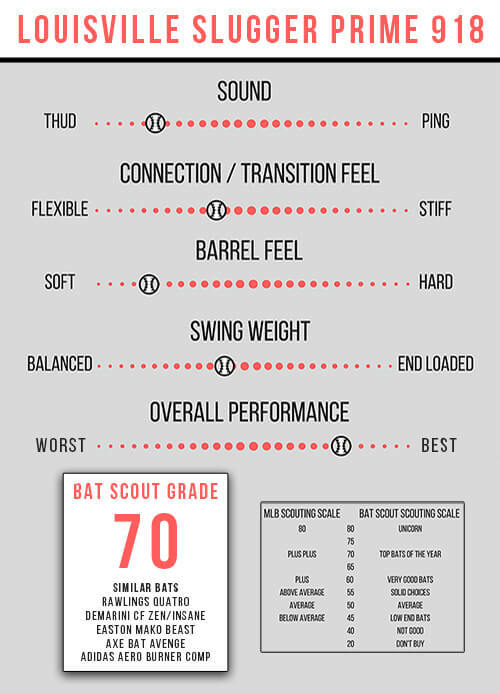 Most composite bats do tend to have a softer feel in general versus aluminum, but this time it really stuck out. I could almost feel the barrel walls flexing on every impact more than usual. As for the actual performance, the ball seemed to shoot off of the barrel on the sweet spot, but more importantly at the inner and outer thirds of the barrel. In my opinion, that is where a lot of good bats separate themselves, by having great performance on balls hit away from the sweet spot. Overall I really enjoyed hitting the Prime 918. The low swing weight, great performance and solid feel will all translate into matching up with a lot of different player swings. If you are in the market for a new multi-piece composite bat, you should check it out. There will be more hitting in the future, but right now the Prime is my early favorite in the 2018 Slugger line. If you’re ready to pick one up, you can find the BBCOR version here, the senior league -10 2 3/4 here and the -8 2 3/4 here.